Fans of Candlefish at Ponce City Market can now go behind the scenes of their favorite candle store and learn how to make their own scented, soy-wax lights. From choosing a scent to pouring two 9-ounce candles, participants ages 15 and older will complete every step of the process under the guidance of a Candlefish chandler, or candle-maker. The completed products will cure overnight and can be retrieved the next day. The classes were introduced in January and are now a regular offering at the store. “Candle-making classes are an important part of the Candlefish experience and our mission as a store,” says Jordan Napper, director of marketing and development. 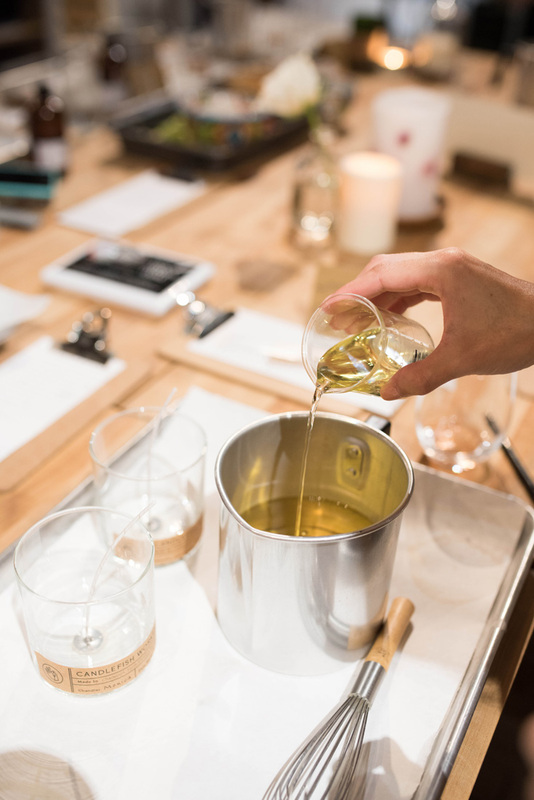 “Our workshops highlight the art of candle-making and tell the story of our brand in a modern, fun way.” The “fun” also comes from attendees bringing their favorite bottles of wine; glassware is provided. Priced from $45, workshops typically last 90 minutes and are offered on various days at noon, 3 p.m., 4 p.m. and 7 p.m. Private group classes also are available by appointment or additional content. Participants receive 15 percent off all in-store merchandise.